Died: 2 October 1899, King William's Town, South Africa. 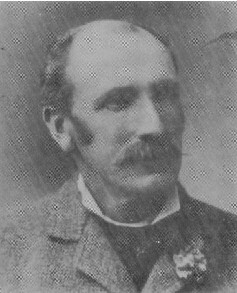 James Dale Ellis, son of John Ellis and his wife Elizabeth, established himself as an auctioneer in King William's Town in 1867 and remained there to his death in 1899. He served on the King William's Town Borough Council around 1870. In 1893 he published his Jottings from the diary of a shooting trip up the East Coast, which ran to 76 pages and had also appeared in a local paper, the Kaffrarian Watchman. In 1882 Ellis made his first attempt to introduce trout into the Cape Colony by importing 20 000 trout ova from England, but the shipment was lost "through misadventure" in East London. Although he was credited by J.D.F. Gilchrist* with having first attempted to introduce trout to South Africa, it seems that an earlier attempt, also unsuccessful, was made by Mr Campbell Johnston in 1875. Ellis tried again two years later and succeeded in getting the ova, many of which had already hatched, to King William's Town, but owing to a lack of ice the water temperature rose too high and all were lost. Meanwhile Lachlan Maclean* imported trout ova to Ceres this year, but failed to establish them in local rivers. The King William's Town Naturalists' Society, founded in July 1884, elected Ellis as a member of its management committee in August 1885. By 1897 he was a joint vice-president. On 17 June 1890 he read a memorable paper before the society, on fish culture and the introduction of trout. His enthusiasm for the venture had been re-awakened during an extended tour through Australia a few years earlier, where he learned of the successful introduction of trout and salmon to some of its rivers. For the next nine years he was the leading light in pioneering the introduction of trout to the region. The society obtained a government grant to experiment with trout ova and established a sub-committee, which included J.D. Ellis, J.S. Lister* and Dr H.M. Chute*, to conduct negiotiations and arrangements. Hatching troughs were set up in the Pirie Mountains, some 30 km north-west of King William's Town, at the source of the Buffalo River. A small shipment of ova arrived in April 1891, but all the hatchlings were killed by a fungus infection a few weeks later. Undeterred, the trout pioneers formed the King William's Town Acclimatization Society in June 1894, with J.D. Ellis as its honorary secretary. It was renamed the Frontier Acclimatization Society later that year. With an increased government grant this society engaged Ernest Latour*, the British pisciculturalist who had successfully brought brown trout ova to Cape Town in 1892, to establish trout at the Pirie Trout Hatchery. This was achieved in 1895 and Latour was succeeded by A.N. Stenning* the next year. Ellis reported on the work carried out at the hatchery during 1898 to Gilchrist, the Marine Biologist of the Cape. He remained intensely involved in its work untill the end of August 1899, a few weeks before his death. In November that year his son, J.D. Ellis jnr, succeeded his father as honorary secretary of the Acclimatisation Society. A few years earlier subscribers to the new King William's Town Museum (later the Kaffrarian Museum) elected Ellis as member of an Executive Committee of Management to supervise the erection of a new museum building. At the committee's firs meeting in February 1897 he became joint vice-president of the committee and participated in its activities to the year of his death. Ellis married Mary Ann Benning before 1870. They had three sons and two daughters. One of their sons, John Dale Ellis, became a partner in his father's business. By 1904 the firm J.D. Ellis & Son, Auctioneers and sworn appraisers, was still in existence. Cape of Good Hope. Report of the Marine Biologist, 1898, pp. 298-299; 1899, pp. 19-20. Gilchrist, J.D.F. The early history of trout acclimatisation in South Africa. In Cape of Good Hope, Report of the Marine Biologist for the year 1897, pp. 137-140. Harrison, A.C. Sixty years ago/Trout pioneering in the Eastern Province. Piscator, 1950, Vol. 4, pp. 44-46, 76-79, 117-120; 1951, Vol. 5, pp. 55-64, 92-96; 1952, Vol. 6, pp. 27-32; 1953, Vol. 7, pp. 83-88, 111-117. James Dale Evans. Geni, at https://www.geni.com/people/James-Dale-Ellis/6000000029865089419 as on 13 October 2016. Kaffrarian Watchman, 2 July 1894, p. 3, "The introduction of trout"; 22 July 1896, p. 3, "The Acclimatisation Society. Annual meeting". King William's Town directory for 1870, p. 6 and directory. King William's Town directory, visitor's guide and residents' handbook, 1897, p. 34; 1902, advertissement of Ellis & Son. King William's Town Naturalists' Society. Minute Book. National Automated Archival Information Retrieval System (NAAIRS). http://www.national.archives.gov.za/naairs.htm Documents relating to James Dale Evans / J.D. Evans.